Pityriasis rosea is a mild, pink-colored rash that is shaped like an oval. It usually develops in patches on the back, chest, and stomach. It occurs most often in young adults, however it can develop at any age. Called a "herald patch", this rash occurs about 1 to 2 weeks before the outbreak of rash. Herald patch of pityriasis rosea. Patches of rash often has a "Christmas tree" or rough triangular pattern on the back. 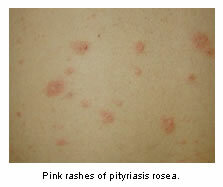 Pityriasis rosea has similar symptoms to other skin conditions, such as eczema, psoriasis, ringworm, and even syphilis. It is thought that this skin condition is caused by a virus. However, it is not contagious. Mild cases of pityriasis rosea may go away by itself and may not require any treatment. There is no direct treatment for this condition - however, corticosteroid creams may be prescribed to help relieve the itching. It is thought that exposure to ultraviolet light - usually done at the doctor's office - can shorten the duration of the condition and help healing. How Long Does Pityriasis Rosea Rash Last? Pityriasis rosea rashes usually last between 2 to 6 weeks. After the rashes go away, people with dark skin may see dark spots that last for several months.